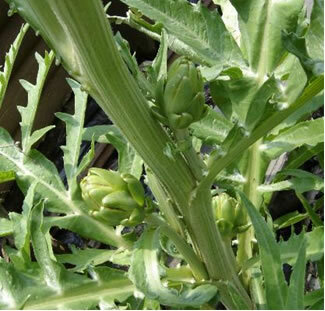 Most Exciting Garden Experience – Artichokes! Finally, some artichokes grew in my garden! This was the first little one, appearing around the middle of July, 2007. Several more followed in each place the leaves attached to the stalk. My first delicious meal of four were cooked and eaten last night, the best part of all. I cut the stems as long a possible because they are edible too. After the tops were trimmed they were boiled in an open pot for about 35 minutes. These were small so I didn’t trim the tips of each leaf. They were so tender that after eating the first outer leaves I then ate all the middle part, leaves, choke and all. Several times I’ve tried growing them, thinking I could protect them to carry them over until the next growing season, but never could. Now this happened in the first growing season. Global warming? They were started indoors quite early in February using Imperial Star. Since I’m in zone 6 they were set out at the end of April. Several times they were covered since frost was forecast, but never happened. 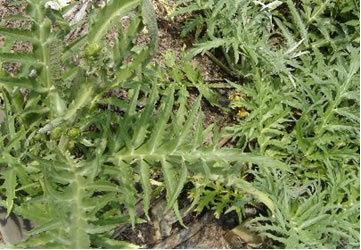 The three plants set out grew to be huge, thistle-like bushes. 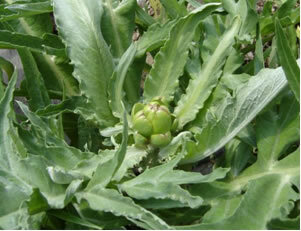 Only one has produced artichokes, but there is still hope for the rest. Previously I had only set out two plants each year. Next year I will try six to see how many, if any, produce. Have read that soaking them in water for 8 hours, and then keeping them in sand in the fridge for two weeks help flowering. Next winter I’ll try that. The main advice is “keep trying” and “have hope.” Where there’s hope, there may be artichokes! Before the first frost I was cutting the artichokes back to be covered. Then I discovered another plant had an artichoke about the size of a golf ball. Sad that it didn’t get bigger, but there’s always next year. This one was being saved for seeds, in hopes it would produce some before frost. The new growth at the bottom gives me hope for the next season. Frost was predicted so I cut it. After it seemed to dry up, these lovely lavender blooms came out. Maybe there will be seeds after all!